Call to all Amazon Workers in Europe. In July …. a European General strike! A call launched by the Spanish Amazon workers to all the workers of Amazon in Europe for a day of strike in the second week July during the Prime Day, because organizing a transnational strike is the only way that Amazon won’t be able to use its logistics network to weaken the effects of the strike. On the website Amazon en Lucha it is possible to find the call translated in several languages. The struggles against the abuses of the multinational company Amazon and for the distribution of its benefits are spreading throughout Europe. In spite of the company’s strategy to open new centres in countries that are “quieter” from the point of view of trade unionism, the tough working conditions it enforces are driving more and more workers to rebel against them. In Poland they are using a hard anti-strike law to impose miserable salaries. In Germany the struggle for a collective agreement guaranteeing the rights of all workers independently of their centre continues. In France the very demanding measures to control times and efficiency remain in place. In Spain the working conditions were unilaterally imposed by the company in its main logistic centre once the previous collective agreement expired. In Italy, where fixed-term contracts are the norm, there are thousands of casual workers in its logistic centres. In the rest of the world Amazon is making history, but hardly distributes its millions in profits. Last March in MAD4 we started an intense struggle to gain back a collective agreement that enshrines our historical rights and sets better working conditions, as we deserve. On March 21st and 22nd we called for a strike that was supported by over 95% of the workers. Since then, we have continued with our actions in order to put pressure on the company. However, we know that Amazon is using its logistic network in Europe to counter the effect of our respective strikes. We in Madrid believe that only if we struggle together will we gain recognition for our demands. Similarly, only with a joint action at a European level will workers organize in those places where there is no union representation yet. It is for these reasons that we are promoting the idea of a European general strike in the second week of July. That is when Prime Day is, a day during which Amazon aims to sell millions of products in what is one of its most important days of sales. The idea is that if no concessions to the workers are made, that day will not take place. In the following weeks we will get in touch with all the centres to discuss the idea and work together in the format of this historical mobilisation. 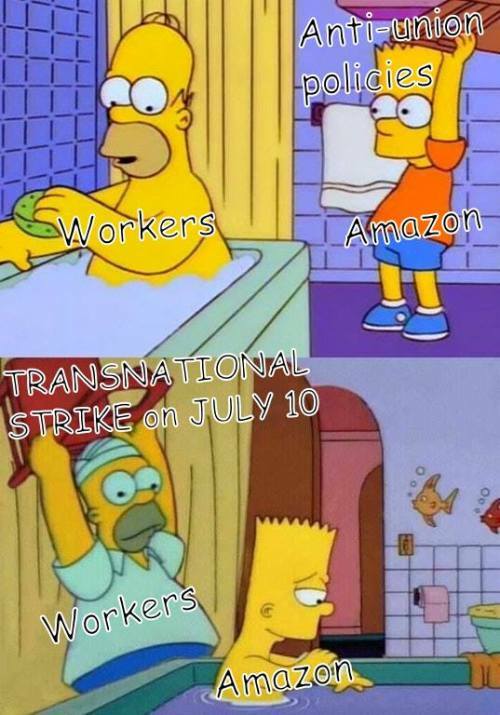 Health and decent jobs for all Amazon workers! To victory always! ...we know that Amazon is using its logistic network in Europe to counter the effect of our respective strikes. We in Madrid believe that only if we struggle together will we gain recognition for our demands. Does anyone know what, if any, role the various Spanish @/syndicalist unions are playing in all this? Are there any English-language statements available from them?